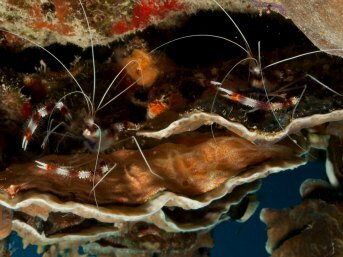 The Banded Coral Shrimp (Stenopus hispidus), also known as the Banded Cleaner Shrimp, is a well-known inhabitant of tropical coral reefs.The Banded Coral Shrimp whips its antannae, while it performs a little ‘dance’ swaying its body from side to side. This attracts fish that, in turn, start flashing their colours to signal to the shrimp that they need cleaning. The fish moves in close enough for the shrimp to reach or, when the fish is big enough, it simply just ‘jumps’ on using their swimmerets, after which it starts removing parasites, fungi and damaged tissue using its three pairs of claws. Two things you might not know about this little creature is that first of all, it is very faithful. A trait mostly associated with mammals and some birds, this little crustacean also choses its mate to pair for a lifetime. The other thing is that they’re very territorial and being as small as they are, this means that their territories can’t be that big. So when you plan your holidays on the same tropical island two years in a row, you will have a big chance of finding the exact same Banded Coral Shrimp (or its mate) within a metre from where you saw it last year.